Snow was in the air on New Year’s Eve in Trikala and I was with a group of friends looking for some much-needed warmth and a good meal after a day touring the Thessaly city. Most of the tavernas in the popular Old Town neighborhood of Manavika were packed, their patrons having planned ahead and made reservations. Hope appeared a bit further along, when we spied an empty table through a window. “Table for eight? Right here,” said the waiter when we inquired within. “Is smoking allowed?” asked one of my group. “Of course not!” stressed the waiter, clearly shocked at the question. In those few days I spent in Trikala over the holidays, I realized that it’s not just that smoking isn’t allowed in public spaces, but it’s obviously not allowed. Speaking to me on the telephone later, Trikala Mayor Dimitris Papastergiou was delighted at my experience in his city. It’s not that he’s happy because a law has been enforced – “that should go without saying,” he said – but because he was able to get the message across. “The issue is not about how you implement a law that has already been passed; it’s about how you shape a society,” he said. It’s more than just work, he added – it’s about taking the right approach. Visitors line up for the Mill of the Elves last December. The Christmas theme park is a municipal initiative which has transformed a former factory into a major attraction, especially for families. Proceeds from the theme park go toward bolstering all sorts of municipal projects to improve mobility, education and quality of life. 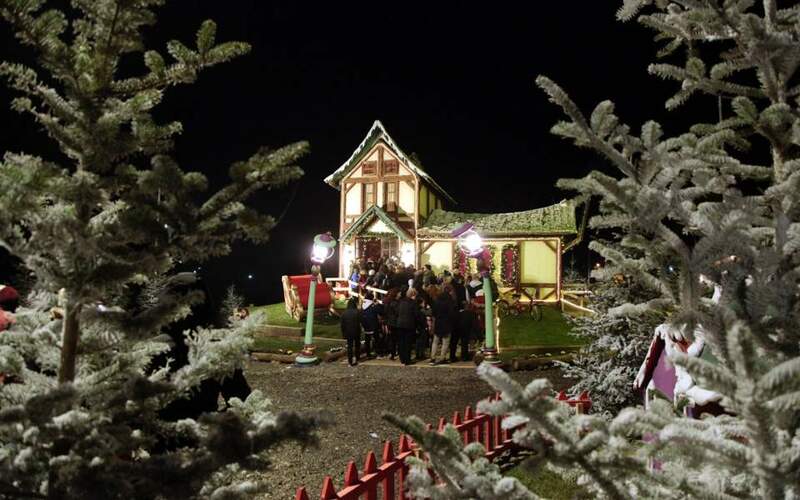 Instrumental to the scheme’s success was the Mill of the Elves, a Christmas theme park owned by the municipality that has helped transform Trikala into a family destination during the festive season. “A city that hosts a theme park like this cannot be a city that tolerates smoking,” said the mayor. Papastergiou launched the scheme in November 2017. “We told the owners of cafes, bars and restaurants that we would would not impose fines for the first month but we would carry out inspections, and advised them to inform their customers that smoking was no longer allowed indoors,” he said. The scheme was a success from the start, and in the time since, authorities have conducted 700 inspections and had to enforce just 50 fines, which start at 600 euros for the first offense and go up to 1,200 and then 2,400 for the second and third. If a business is found in violation of the ban a fourth time, its license is suspended for 10 days, with the fifth violation leading to closure. Violations are rare, however. “It became apparent this holiday season that the community has understood the measure and its purpose. Even smokers express support, saying that it helps them smoke less. We do, of course, still get the occasional complaint about smoking from citizens,” said Papastergiou. In a bid to support businesses, the municipal authority has allowed them to set up outdoor plastic enclosures with seating and propane heaters to accommodate smokers. It’s not just the smoke-free cafes and bars that set Trikala apart from other Greek cities, though: Cars stop at pedestrian crossings, there are lots of people riding bicycles everywhere, the streets and sidewalks are clean and tidy, and all the business staff seem to be polite. Despite being slammed by the economic crisis, along with the entire Thessaly plain – Greece’s main agricultural area – and an unemployment rate of around 25 percent, Trikala nevertheless exudes a sense of optimism. The growing success of the theme park – it received more than 1 million visitors this year – has been pivotal to the success of the municipal authority’s initiatives to improve citizens’ lives, by generating the revenues needed to carry them out. 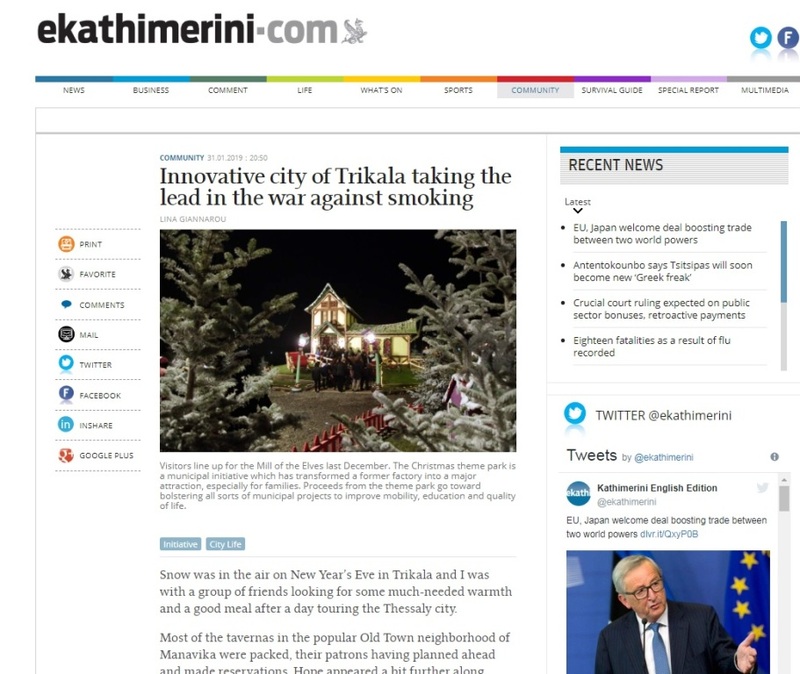 Trikala has already made the headlines for its role in initiatives like the CityMobil2 program of driverless buses, its introduction of smart lighting systems, along with smart parking and garbage collection, as well as other digital services. “We don’t do these things to impress anyone, but rather to have an impact on residents’ lives. Technology is the means, not the destination,” said Papastergiou.